We obviously love our gadgets around here. But, as worked up as we get for things with octa-core processors and 4K displays, what really excites us about technology is its ability to improve people's lives. And while having an endless repository of information at your fingertips 24/7 certainly qualifies, we're more interested in the people working to solve real problems. In the basement of the Egan Research Center at Northeastern University, a group of students are toiling away under the watchful eye and guidance of professor Constantinos Mavroidis to build a rather unique device called the Virtually-Interfaced Robotic Ankle and Balance Trainer -- or vi-RABT. For the better part of a year the team has been working on what started life as a Capstone project. The concept began when Dr. Maureen Holden, from the school's physical therapy department, came to the laboratory with a problem: how can we improve the speed and quality of recovery for stroke patients who have lost strength in their ankles and struggle to stay balanced? Describing the vi-RABT is tough. Aesthetically, it's little more than a robust steel frame with a few gears and motors hanging off it. On top is a blue platform that appears to be acrylic. That platform is home to four sensors that measure the pressure a foot places on it. These not only are able to determine the strength with which a subject is able to push off with but can also determine their center of gravity and balance. 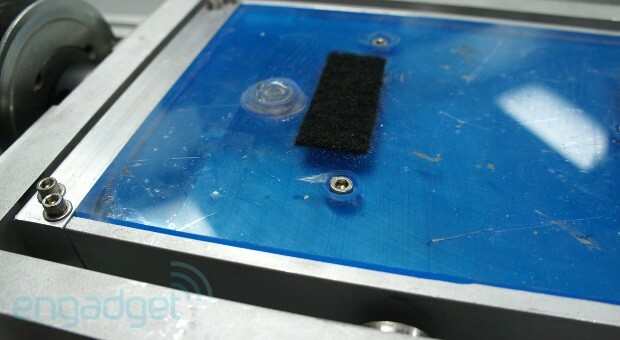 Underneath the Velcro-scarred acrylic are two springs that measure force in the opposite direction. What you see here is just one component of a larger apparatus, and to truly appreciate it, let's put in context. Two of these devices will eventually be placed side by side inside a larger stationary platform with guard rails around it. A patient would climb up, strap their feet into a set of restraints (which have yet to be finalized, but will likely draw inspiration from ski boots) and perform a series of tests to determine a baseline ability. This is where the motors come in. After collecting the data, an exercise regiment would be designed using a piece of companion software. The pair of motors, gearboxes and pulleys would then be used to provide assistance in two degrees of freedom, to help stroke victims slowly build back up their strength. That's the "robotic" part of the equation. There are other devices out there that aim to accomplish the same goal, but they have an extraordinarily simple design and much more limited functionality. The assisted movement could mean quicker recovery and the objective data collection should reduce the amount of trial and error involved in determining a starting point for exercises. The sensors aren't just for populating a database either. 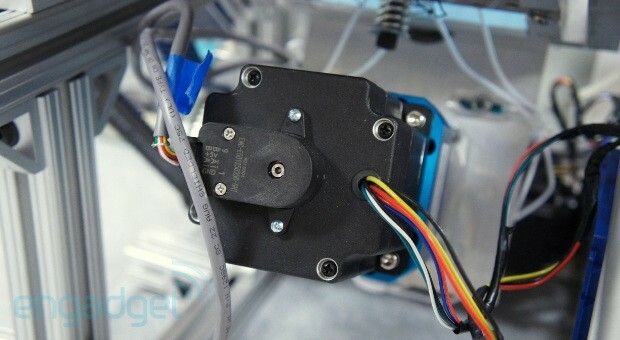 They're capable of collecting real time data that could then be used to control the motors. Though the software component still needs to be built, the feedback from the forceplate could sense if a patient is about to lose his or her balance and compensate to keep the subject upright. And thanks to the high-torque design, this will work for patients up to 300 pounds without additional harnesses or support. What the team quickly realized is that the motors on board can not only provide assistance, but also resistance. This opened up the possibility of using the vi-RABT not just with stroke victims, but with rehabilitating athletes who suffer an ankle injury. So if that linebacker built like a refrigerator sprains an ankle, this could be the key to a swift recovery. The team (comprised of students, Alex Mazzotta, Nate Lavins, JP Valenzuela, Alexandra Bugliari and Paul Douçot with the aide of Amir Bejestan as their graduate adviser) is now entering the final stages of the design. After putting together the first piece in roughly three weeks, the next step is completing the platform and building out the "virtual reality" component of the system. This won't be an Oculus Rift-like headset, though. Instead it will rely on a large screen to display scenery to simulate walking, running or bike riding. The idea is that the visual cues, combined with the physical ones help stroke patients rebuild nerve connections more quickly through the combination of stimuli. There are also plans for gaming elements that will help track progress and provide encouragement. Perhaps the most exciting part though, is the cost. Similar systems can cost up to $60,000. So far the team has spent just a fraction of that -- $6,000. Of course, there is still plenty of work to be done, but Amir is confident that a commercial version of the vi-RABT could cost as little as $10,000 and be available in two years. Make sure to check out the video above to see it in action and follow the barely launched vi-RABT site at the more coverage link for updates.